This August, we celebrate 5 years in business. We couldn’t have done it without the people who we now consider family — longtime clients, staff & admin. Michele Fillion has been coming faithfully since 2007, even before the orange swirl appeared! We asked her to chime in about what drew her, and what continues to draw her, to Kinected. Kinected: What brought you to Kinected? Michele Fillion: After giving birth at 47 (!!) with no drugs and a mid-wife, my hips felt completely disjointed. Someone recommended I try Pilates. I tried a class, but felt that my needs were very specific, so I began one-on-one work with Kelly Kane. 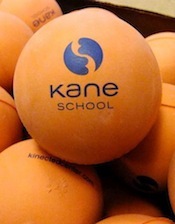 It was still solely the Kane School at the time. K: What instructors have you seen since coming to Kinected? MF: I’ve worked with Dianne, Matt, Marisol, Bridget (Rolfer®), Marie (Rolfer®) and Elliot (physical therapist). I have also taken various classes. I think the combination of working with the different instructors has helped me to fully investigate how my body works — specifically the Pilates and Rolfing® work. K: What’s your favorite prop/exercise/piece of equipment? MF: I like moving from prop to equipment. I enjoy the variety of exercises and challenges on the equipment. K: What makes Kinected unique? MF: The people. Everyone is very friendly, helpful, patient, and professional without being distant or removed. The atmosphere is calm and the work is serious. It’s a great combination. What also makes Kinected unique is the specificity of instruction, from the individual sessions to the group classes. You won’t find that elsewhere in the city. As hokey as this may sound, the people really care — I get top-notch recommendations for other healthcare professionals if I am injured or need a treatment otherwise not offered at Kinected. For example: One day I could not get out of bed so severe was my neck pain — from sneezing! Since we live so close to Kinected my husband called and asked if there was an instructor who could come over and help me do some stretching. I assumed I would be in bed for several days with this pain. I literally could not move without experiencing incredible pain. Kinected sent over Bridget, who was the Rolfer® at the time. Within an hour and half of her working on me, I was up and walking. My neck was moving. It really was a miracle. Thus, began my odyssey with Rolfing®. I was very happy to be introduced to this type of body work. MF: The studio has evolved since I have been going with the growing diversity of classes offered and the incorporation of Rolfing®, physiotherapy, etc. K: What’s the biggest difference you’ve noticed in yourself since coming to Kinected? MF: As an active person, invariably, I have some ache or pain when I walk in for my session. Dianne tailors the session to my individual needs on that day. I leave feeling taller and the pain or muscle grip has been released. I have also, over the years, as a result of the work I have done at Kinected, developed an understanding and appreciation of how my own body works and I have an increased awareness of how to move or position myself in my other activities so that I don’t injure myself. Dianne and I will frequently sidebar with the skeleton or one of the manuals so that I can fully understand the exercise that I am working on or the origin of my ache or pain. I have a greater awareness of my body and how it moves since starting my instruction at Kinected, and this has gone a long way to help me avoid injury and develop strategies to avoid pain in my day-to-day work life sitting at my computer. Finally, everyone in my family has gone to Kinected — except my 6 year old — my 15 year-old ballet dancer, my 18 year-old ice skater and my husband. Stay tuned for future features with clients & staff, fun facts about our family abroad, and more! Come & visit us on Monday, 8/5, for our kick-off celebration — $5 off classes all day long, sweet treats from Enlightened, and raffle to be entered to win Kinected swag!